Often, renewable energy generation seems to be a pipe dream. Far away, expensive and only available to governments and extremely wealthy individuals. However, this is a myth. Just a quick search online will yield a vast trove of results for consumer appliances powered by solar energy and wind energy, and even more tutorials on how to install renewable energy sources. This is not an uncommon phenomenon, but when talking about mass scale industrial renewable energy generation – there are few projects to be seen available for the common layman. Solar energy, using PV or photo-voltaic cells which convert sunlight into electrical energy. Solar cells currently operate at about 15%-25% maximum efficiency, meaning that only up to 25% of the sunlight that falls on a photo-voltaic cell is converted to energy. The 25% figure, is achieved only in lab tests, in real life actual usage, it usually falls to 20% maximum. As expected, PV cells can only be deployed in areas with sunlight, and the stronger the sunlight, the better. On top of that, solar energy farms need a massive area to capture sunlight to produce a reasonable amount of electricity to justify its cost. Another form of solar energy is based off mirrors and a steam turbine. Multiple mirrors focus the sun’s rays on a boiler tank painted in black. This heat collected by the multiple mirrors focussing the sun’s rays on it causes the water to vaporize into steam, which then turns the turbines connected to the boiler tank and generates electrical energy. Wind energy, usually through wind turbines, which use the kinetic energy of moving air to turn fan blades, which then turn a generator, generating an electrical current. Hydroelectric energy, this form uses the gravitational potential of elevated water that was lifted from the oceans by sunlight. It is not strictly speaking renewable since all reservoirs eventually fill up and require very expensive excavation to become useful again. At this time, most of the available locations for hydroelectric dams are already used in the developed world. And the not-so-well known source wave energy. Wave energy generators operate using a combination of hydraulic systems and floats to harness the kinetic energy of underwater currents. The waves force a series of floats to bob up and down. These floats are connected via a hydraulic system to generate more force upon the floats being pushed up, and then the hydraulic system turns gears connected to series or one turbine, dependent of the configuration of the station. Due to the complex nature, as well as the relatively new development stage it is in, and selective sites in which this kind of station can be deployed, it is uncommon to see consumers using these for renewable energy generation. In Germany, there are 3 main sources of energy. Traditional and more polluting coal fired plants, older nuclear powered plants, and lastly, renewable energy, which consist mainly of solar and wind power. The German government decided along with the German public to close down the nuclear power plants following the Chernobyl power plant disaster – and then following that in modern times, the Fukushima power plant disaster. They decided that they could not replace all the nuclear power plants with coal fired plants either, as it would only cause more issues with climate change. In the 2000’s, climate change came to the forefront of global attention, and with solar and wind technology catching up, Germany took the leap with the Energiewende in 2011. Energiewende means energy transition, while others have used it to mean a green energy revolution. The term represents a change in the policy of managing energy through supply and demand commonly found in most markets, to a centralized to distribution model from smaller units. Such units include houses which produce and also supply energy back to the power grid. 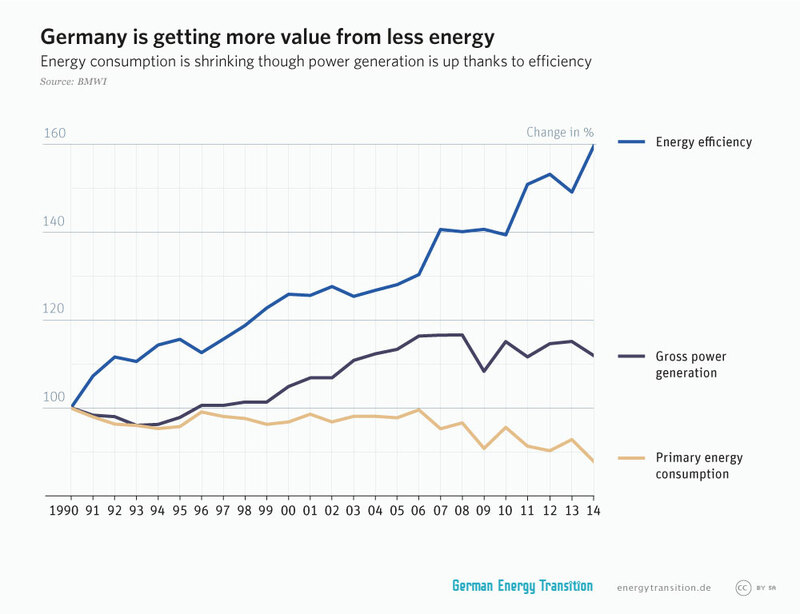 The German Energiewende did not just come about in 2011. It is rooted in the anti-nuclear movement of the 1970’s. In addition, Energiewende also encompasses the emphasis on efficiency in the production and distribution of power, as the faster and closer proximity to the supply and consumption sites of energy as well as increased energy saving measures boosts efficiency. The policy was published in September 2011, about 6 months after the Fukushima nuclear disaster, only emphasizing how much the change to renewable energy was needed. It was finally passed and made into official policy in 2011. Apart from green energy generation, the document also contains some very ambitious and important aspects. These include a reduction in greenhouse gas emissions by 80-95% by 2050, an increase in renewable energy generation to 60% of consumption nationally, as well as an increase in electric energy efficiency by 2050. They key tenet of the Energiewende however has been citizen action and cooperation to feed into the energy grid. This action has led to the creation of energy cooperatives and citizen investors pooling their money and land to fund and construct renewable energy sources. As a result, Germany’s share of renewable energy generation and usage has increased from around 5% in 1999 to 22.9% in 2012, reaching close to the OECD average of 18% usage of renewable energy. Of course, these cooperatives not only fund and construct renewable energy sources such as wind turbines(as wind is the most common renewable energy resource in Germany) but they also take profits in a scheme where excess power is sold back to the grid. As a result, profits and power has been decentralized, creating a competitive market in which there are few large energy companies that have a large share in the renewable energy market. This is only possible due to citizen action and cooperation leading to legislation reflected in the Energiewende policy which allows for a sustainable and realistic approach to the transition from fossil fuel generated energy to renewable energy.